Limit the spread of germs within your daycare with this theme’s games, crafts, workshops, and activities! 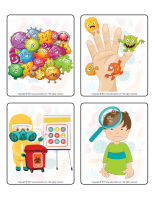 Door decorations, word flashcards, infectious disease posters, activity sheets, and many other documents to teach little ones all about germs. 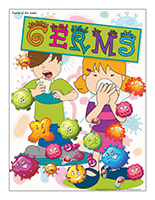 (Open thematic poster-Germs) Print, laminate, and decorate the walls of your daycare with all kinds of posters. 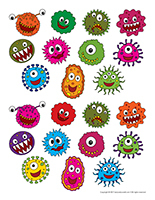 (Open door decorations-Germs) Print, cut out, and laminate. Use the items to decorate your daycare entrance and set the mood for the theme. (Open group identification-Germs) Print and laminate the various items. Use them to identify children's belongings and various areas within your daycare. (Open Beware of germs) Print and display. 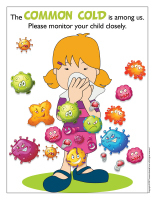 Use the poster to help children learn the best way to avoid spreading germs when they cough, sneeze, or blow their nose. 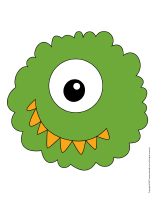 (Open educa-decorate-Germs) Print, laminate, and cut out the illustrations. Use them to decorate your walls and set the mood for the theme. (Open garland-Germs) Print and let children decorate the garland elements. Cut out the items and use them to create a garland that can be hung near your daycare entrance or within your daycare. This tool was created in response to a special request received. (Open poster-Infectious diseases) Print and display to inform parents of the presence of an infectious disease or situation. 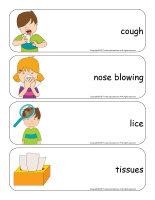 (Open word flashcards-Germs) (Open giant word flashcards-Germs) Print, laminate, and display the word flashcards on a wall within your circle time area or on a large piece of cardboard that can be moved around. Children take turns identifying a flashcard or naming an item. (Open picture game-Germs) Print and laminate the pictures in the format you prefer. Use them to spark a conversation with your group. Ask children questions about germs. (Open picture game-Germs) Print and laminate the pictures in the format you prefer. Use a hole-punch to make a hole in the upper right and left corner of each picture. Stack the pictures and insert a ring through each set of holes. The flipogram is easy to manipulate. Simply show children how they can lift a picture and flip it under the stack. Name each item with your group. Use the flipogram to encourage children to talk during circle time and to ask them questions about the theme. The pictures may be used as a memory game or to spark a conversation with the group. Use them to decorate the daycare or a specific thematic corner. 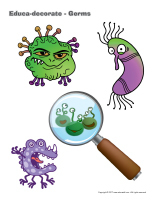 (Open picture game-Germs) Print, laminate, and store in a "Ziploc" bag or in your thematic bins. (Open picture game-Germs) Print the pictures twice and use them for a memory game. 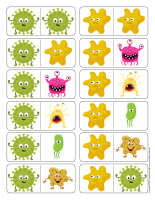 (Open activity sheets-Germs) Print and follow instructions. If you wish, laminate for use with a dry-erase marker. 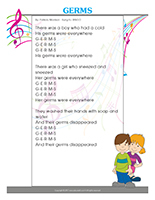 (Open writing activities-G like germ) Print for each child or laminate for use with a dry-erase marker. (Open word flashcards-Germs) (Open giant word flashcards-Germs) Print several word flashcards. Glue them on pieces of paper, laminate them, and arrange them in a binder. Show children how they can trace the words using dry-erase markers. If you wish, leave room under each word so children can try to write the words without tracing the letters. 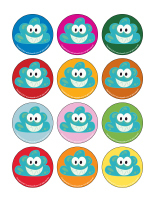 (Open educa-nuudles-Germs) Print for each child. 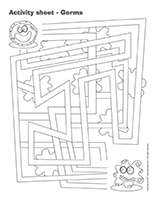 Have children color the sheet and use Magic Nuudles to give it a three-dimensional look. Variation: You don't have Magic Nuudles? Have children fill the spaces designed for Magic Nuudles with bingo markers or stickers. To order Magic Nuudles. (Open stationery-Germs) Print. Use the stationery to communicate with parents, in your writing area, or to identify your thematic bins. (Open posters-workshops) Print, laminate, and display to identify your various workshops. (Open workshop planning booklet) Print, laminate, and use the grid with a dry-erase marker. This essential tool will help you prepare and create the material you need for your various workshops, organize your environment, and plan per the interests of the children in your group. It will also help you analyze your weekly activities. (Open workshop follow-up booklet) Print for each child. This booklet will help you better understand how workshops foster children's development. Add facecloths children can use for soft creations. Add empty beauty and hygiene product bottles and containers (shampoo, soap, etc.). Draw on dark construction paper with bars of soap. Blow colourful soap bubbles on white paper to create abstract designs. Use toothbrushes and toothpaste for a painting activity. Gel toothpaste is interesting on dark paper. Use a cardboard box to represent a bathtub. Add facecloths, towels, empty shampoo bottles, etc. An old hairdryer or a toy version along with hairdressing accessories. Memory game with educatall.com picture game. Stimulation bottles filled with soap for children to explore. Association game. For example, a picture of a child who is brushing his teeth can be associated with a toothpaste illustration. Puzzles related to the theme...if you can find them! Sequential stories representing the proper hand washing or toothbrushing technique. Books of all kinds...for a relaxing activity. Soft music with blankets and pillows. A large container filled with a mixture of water and soap along with drinking straws children can blow through to produce lots and lots of bubbles. A container filled with water, bars of soap, and facecloths. Add empty shampoo bottles and a few shower sponges. Fill a container with bubble solution and add a variety of instruments children can use to blow bubbles. (Open sequential story-Germs) Print the story. Laminate the illustrations and cut them out. Children must place the illustrations in the correct order. (Open word flashcards-Germs) (Open giant word flashcards-Germs) Print and laminate the word flashcards. Have each child pick a word and present it to the group (ex. fever). Ask them questions to see what they know about the theme. 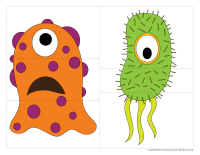 (Open word flashcards-Germs) (Open giant word flashcards-Germs) Print many copies of the word flashcards and encourage children to use scrabble tiles to write the words. Manipulating the small tiles represents a great fine motor skill exercise. At the same time, children will notice which letters make up the different words. (Open word flashcards-Germs) (Open giant word flashcards-Germs) Print two copies of several different word flashcards. On a large piece of cardboard, stick one copy of each flashcard vertically to create a word column. Cut the second copy of each word flashcard so you have the word on one side and the illustration on the other side. Attach Velcro behind each part as well as to the right of the uncut flashcards (on the cardboard). Arrange the cut flashcards on the table and encourage children to look at your flashcard board to identify a matching word and illustration. When they succeed, they may stick them next to the corresponding flashcard, on your board. This exercise will help children associate words with pictures. 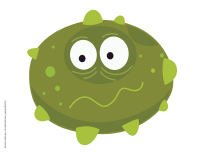 (Open word flashcards-Germs) (Open giant word flashcards-Germs) Print several word flashcards. Use a hole-punch to make a hole at the top of each flashcard. Thread a ribbon through each hole and tie a knot. Bring the word flashcards outside and encourage children to use them to decorate a tree. Every time a child adds a flashcard, invite him/her to "read" the corresponding word. Children will be happy to repeat this activity many times. Eventually, they will learn to recognize the words. (Open word flashcards-Germs) (Open giant word flashcards-Germs) Print two copies of several word flashcards. Hang one copy of each word on an indoor clothesline with colourful clothespins. Arrange the copies in a pile on a table. Let children take turns picking a word and finding the matching word on the clothesline. When they find a match, they can place the flashcard on top of the one that was already hanging on the clothesline. Help younger children manipulate the clothespins if necessary. (Open word flashcards-Germs) (Open giant word flashcards-Germs) Print several word flashcards and hide them throughout your daycare or yard. Divide your group into two teams. When you give them the signal, children must search for the flashcards for a pre-determined period, for example three minutes. When the time is up, children must be able to "read" their flashcards to earn a point for their team. If they are unable to find the correct word, the other team can earn the point if they succeed. (Open picture game-Germs) Print each illustration twice. Use adhesive paper to secure one copy of each illustration on the table. Deposit the second copy of each illustration in an opaque bag and invite children to pick a card that will determine their spot at the table (corresponding illustration). The illustrations can also be used to determine children's naptime spots or their place in the task train. (Open models-Germs) Print and laminate the illustrations in the format you prefer. Arrange them on the floor and invite children to hop from one germ to the next on one foot, on two feet, backwards, etc. The goal is to develop children's gross motor skills. Every time you head to the cloakroom, the bathroom, the table, etc., walk backwards to represent how germs work against or immune system. (Open 6 steps for hand washing) Print, laminate, and display next to the sink where children usually wash their hands. Play music and encourage each child to wash his hands for the duration of one song. (Open motivation chart-hand washing) Print for each child. Let children add a picture to their chart every time the wash their hands properly. (Open game-this is my spot-Germs) Print each illustration twice. Use adhesive paper to secure one copy of each illustration on the table. Deposit the second copy of each illustration in an opaque bag and invite children to pick a card that will determine their spot at the table (corresponding illustration). The illustrations can also be used to determine children's naptime spots or their place in the task train. 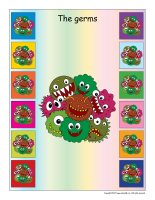 (Open my germ path) Print, laminate, and arrange the illustrations on the floor to create a path that leads to various frequently visited areas within your daycare such as the cloakroom, the bathroom, etc. Just like in the popular game "Simon says...", dictate various instructions. Children must execute them only if you say, "The germ says..." first. Provide cushions or pillows children can use for a silly pillow fight. Invite children to take giant steps and make strange sounds to represent germs. They may also use musical instruments. Hide plastic germs throughout your daycare. When you give children the signal, they must hunt for them. 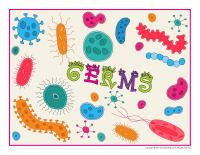 You may also use germ illustrations (Open miniature germs) Print and laminate. Provide several boxes in different sizes and styles. Select a child who will play the role of the germ. This child leaves the room while the others hide among the boxes to avoid being captured by the germ. The first child who is found becomes the germ for the next round. 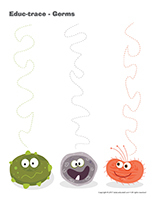 (Open string activities-Germs) Print for each child. Children trace the shape outlines with white glue and press string on the glue. Encourage children to use their imagination to build cabins and hideouts with bath towels, chairs, tables, etc. 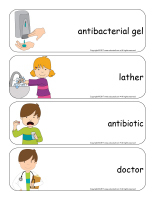 (Open germs-personal hygiene) Print and laminate. Hide the germs throughout your daycare. Set a large jar on the floor, in the centre of your daycare. Children search for the germs. Every time a child finds one, he must drop it in your jar as you quickly remove and replace the lid, pretending you are afraid the other germs will escape. Show children a variety of items you will hide within your daycare (facecloth, comb, toothbrush, etc.). Have them close their eyes or go to another room while you hide them. When you are ready, invite them to search for the items. Divide your group into small teams of two or three children. Each team must pick a child who will pretend to be a germ. When you give them the signal, the other children must wrap their germ in toilet paper, to the sound of music. When the music stops, the winning team is the one with the best-wrapped germ. Teach children about the importance of cleaning toys to eliminate bacteria. Provide buckets of lukewarm water, dish towels, and facecloths and invite them to help you clean your daycare toys. Sit on oversized bath towels to enjoy a simple picnic with your group. Divide your group into two equal teams. Draw a start and finish line on the ground. Set a bucket filled with water on the start line for each team and drop a sponge inside each team's bucket. Set an empty bucket on the finish line for each team. Players from each team take turns filling their sponge with water, running to the finish line, and squeezing the water from the sponge into their team's bucket before running back to hand the sponge to the next child in line. The winning team will be the team with the most water in their bucket at the end of the activity. This activity is great on a hot summer day. Children should wear their bathing suits since they will surely get very wet! Arrange several germ illustrations on the floor (Open germs-personal hygiene) You must have one illustration less than the number of children in your group, just like in musical chairs. Children dance around the illustrations to the sound of music. When the music stops, children rush to sit on an illustration. The child who is left without an illustration to sit on is eliminated. Remove an illustration and repeat until a single germ is left. 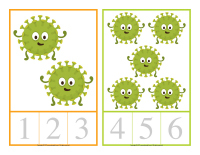 (Open counting cards-Germs) Print and laminate. Prepare a series of wooden clothespins on which you can paint or draw numbers 1 to 9. Children count the items on each card and place the corresponding clothespin on the correct number. 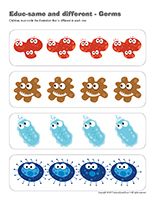 (Open roll and color-Germs) Print for each child. This game can be enjoyed individually or as a group. Children take turns rolling a die, counting the dots, and coloring the corresponding part. (Open educ-dominoes-Germs) Print and laminate the dominoes. Children pick five dominoes each. Arrange the other dominoes in a pile, except for one that is placed in the centre of the table. Children take turns trying to match an item to an item on the end of the available dominoes. If they cannot play a domino they already have, they must pick another one. If they cannot play it either, their turn is over. (Open educ-trace-Germs) Print for each child. Children must trace the lines using a crayon of the designated color and then color the item at the end of each line with the corresponding color. 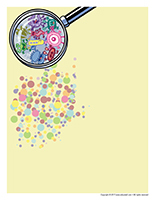 (Open educ-same and different-Germs) Print and laminate for durable, eco-friendly use. 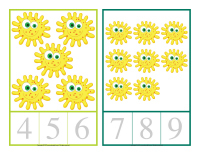 Children must circle the illustration that is different in each row. (Open my invented germ) Print, laminate, and cut each illustration into three parts. Set the pieces on a table and encourage children to assemble them as they see fit, using the head, body, and feet they prefer. They can mix and match the body parts. (Open game-The germ's eye) Print, laminate, and cut out the parts. Display the germ's face on a wall. Give each child a laminated eye. Blindfold children and invite them to stick the eye as close to the centre as possible. In a large area, set a variety of objects to represent places where germs like to hide (under a table, behind a couch, behind a door, etc.). Children must follow instructions and pretend they are germs. For example, if you say, "The germs are hiding under the table", children must run to hide under the table. Variation: If the children in your group are old enough, turn the lights off and provide flashlights. (Open picture game-Germs) Print and arrange the illustrations on the floor, throughout the daycare. You must have one illustration less than the number of children in your group, just like in musical chairs. Children dance around the illustrations to the sound of music. When the music stops, children rush to sit on an illustration. The child who is left without an illustration to sit on is eliminated. Remove an illustration and repeat until a single germ is left. (Open game-Four germs) Print, glue the document on opaque cardboard, and cut out the cards. Place all the cards face down on the floor (so children cannot see the germs). Children take turns rolling the die. Every time the die lands on "1", the child who rolled it can pick a card, without showing it to the other children. If he does not already have the germ, he places it in front of him for everyone to see. The first child who has all four germs wins. (Open photo booth-Germs) Print the various accessories, cut them out, and glue a drinking straw behind each one. Purchase hats, scarves, glasses, etc. at your local dollar store. Create a décor using a large piece of cardboard or curtain. Invite children to pick the accessories they prefer and pose for you. You can take individual, group, or family photos. Print the pictures and display them on a wall for everyone to see. (Open sequential story-Personal hygiene) Print and laminate the illustrations. Let children manipulate the illustrations and place them in the correct order. Children take turns saying, "For bath time, I need..." and completing the sentence with an item such as soap, a facecloth, a bath towel, bubble bath, etc. Each child must name all the items previously stated before adding one of his own. Play "Simon says..." with your group, instructing them to wash the germs off different body parts (ears, feet, elbows, etc.). 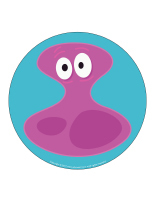 (Open word flashcards-Germs) (Open giant word flashcards-Germs) Print and laminate the flashcards. Deposit them in an opaque bag and use them for a mime game. Children take turns picking a word and miming it so the other children can identify the correct word. For example, if a child picks the word "doctor", he/she can pretend to listen to another child's heartbeat with an imaginary stethoscope. 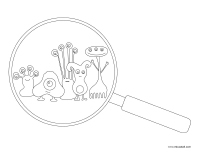 (Open models-Tiny finger germs) Print and let children color the models. Glue them on heavy cardboard. Cut the strip at the bottom of each illustration and stick both ends together to form a circle. Children can insert a finger in the circles and use the germs as finger puppets. Provide a batch of old modeling dough and invite children to use it to represent a germ. Add pipe cleaners for arms, wiggly eyes, etc. Set your germ aside to dry and display it within your daycare. Fill containers with water and let children wash dolls. Provide facecloths and soap. (Open faces, arms, legs) Print. Purchase a bag of inexpensive combs. Empty its contents in the centre of the table. Children will enjoy gluing the faces, arms, and legs on the combs to represent characters. Purchase several different bars of scented soap and encourage children to smell them. If possible, pick scents that children will be able to recognize and invite them to identify them. Let children play in water. You can simply fill a sink with water and let each child play for a certain period (use a timer to determine the duration). Provide a variety of objects and invite children to manipulate them to discover which items float and which items sink. Let children manipulate bars of soap and liquid soap. You can pour a small quantity of liquid soap on paper and encourage children to use it to draw with their finger. Children can use bars of soap to draw on dark paper. Add bubble bath to your kiddie pools and let children splash around. (Open masks-Germs) Print and set the germ models in the centre of your arts & crafts table. Give each child a paper plate in which you have already cut out two holes for the eyes. Let children create their own unique germ-filled mask. Attach a piece of string to either side so you can tie their mask behind their head. (Open models-Germs) Print the various models and use them for different activities and projects throughout the theme. (Open puppets-Germs) Print the various models on cardboard. Ask children to cut them out and decorate them with arts & crafts materials. Glue a Popsicle stick behind each one to complete the puppets. Give each child a bar of soap. Provide modeling dough tools they can use to sculpt their bar of soap. They can give their soap sculpture to someone special or take it home and use it at bath time. Provide several different sizes of sponges with a variety of textures and let children use them for a painting activity. Give each child a white bath towel or ask parents to send a white bath towel to daycare. Encourage children to use fabric paint to decorate their towel with footprints and handprints. They can also use fabric markers to further decorate their towel, write their name, etc. Follow manufacturers' instructions to set the color on the fabric. Use wiggly eyes, yarn, coffee sticks, pipe cleaners, felt, and construction paper to decorate sponges with your group. The goal Is to create an entire sponge family. Let children paint freely using toothbrushes instead of paintbrushes. 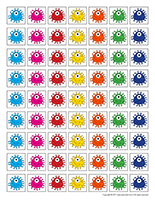 (Open coloring pages theme-Germs) Print for each child.